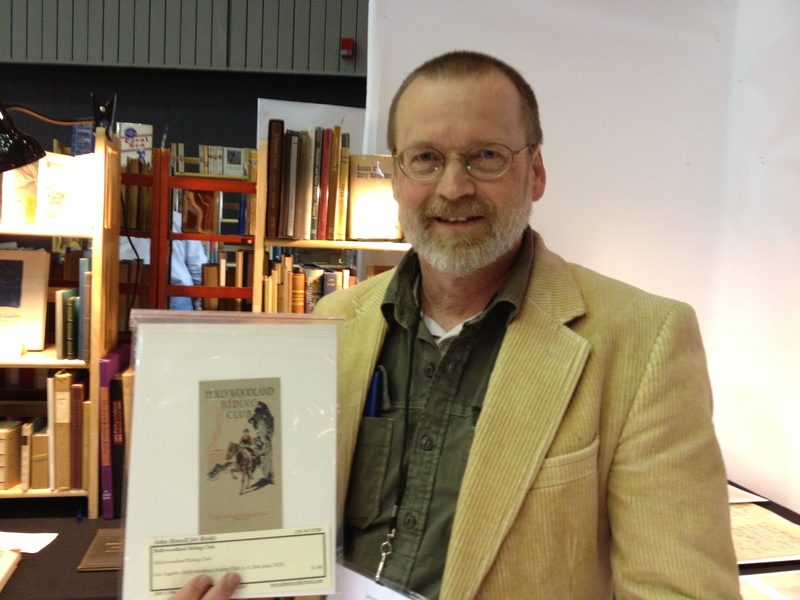 Last Sunday I stopped by the Antiquarian Book Fair at the Santa Monica Civic. 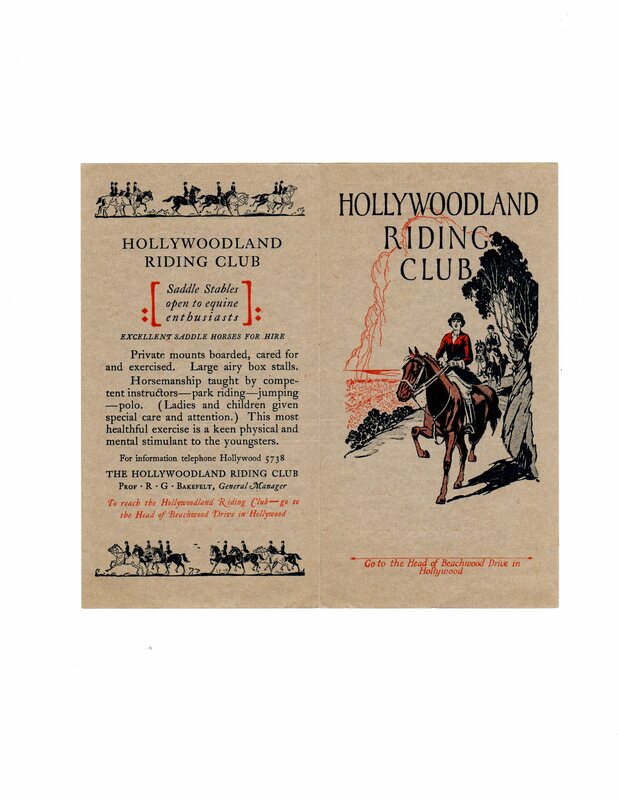 I was there to meet John Howell, a rare book dealer who had emailed to tell me about one of his offerings, a pristine pamphlet advertising the long-defunct Hollywoodland Riding Club. Listen–the horses are stamping in their stalls-the sea breeze kisses the hilltops-while the birds weave melodies of happiness on the open trail. Your day in Hollywoodland-in-California begins with a song, and for a brief hour you canter on the wings of the morning–a shower-breakfast-and away for a day at the office, to return at eventide to the calmness of the hills, and there below you, watch a myriad of millions of lights twinkling in the distance. Conceived as a tercentennial commemoration of Shakespeare’s death, Beachwood Canyon’s 1916 production of “Julius Caesar” was an event of epic proportions. A one-night-only performance, it involved 5,000 players–actors, dancers, gladiators and the student bodies of Hollywood and Fairfax High Schools–and starred Tyrone Power as Marcus Brutus and Douglas Fairbanks as Young Cato. Other notables in the cast were William Farnum (Cassius), DeWolf Hopper (Casca) and Mae Murray (Barbaric Dancer). The Battle of Philippi was re-created by sword-wielding actors who fought their way up Beachwood Drive onto a vast stage constructed on the future site of Beachwood Village. The play was performed before an audience of 40,000–at a time when the population of Los Angeles was only 852,000. According to a newspaper account, there was a single fatality–an elderly woman who fell on the walk up to the amphitheater and did not regain consciousness. 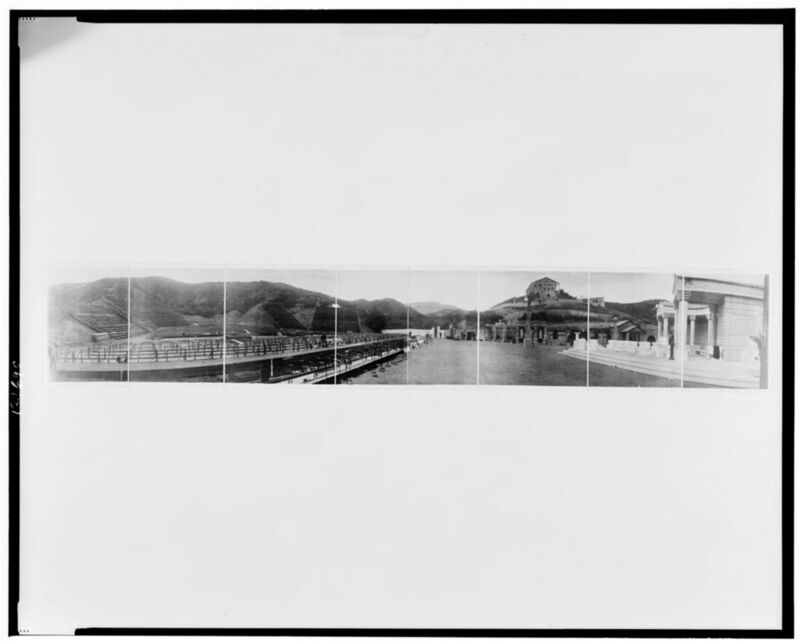 The only known photograph of the momentous night is the panoramic photo of the set reproduced above. For those familiar with the area, the bleachers in the first four panels occupy the west side of Beachwood Drive from Belden to (approximately) Woodhaven. 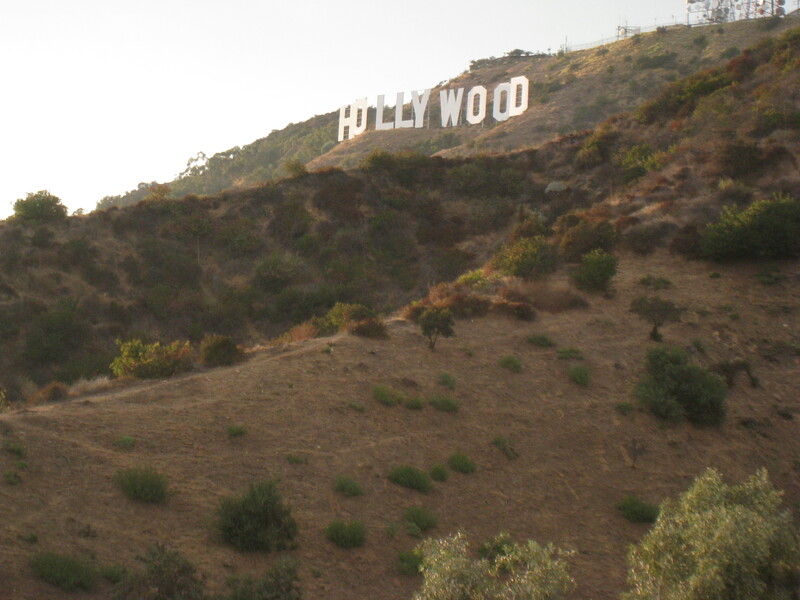 Panel 5 shows Cahuenga Peak, future home of the Hollywoodland Sign. The temple in panels 6 and 7 stands at the top of Westshire, while the main stage occupies the east side of Beachwood Drive from Hollywoodland Realty to (approximately) Woodhaven. The lavish sets came courtesy of D.W. Griffith, Jesse Lasky, Thomas Ince, Mack Sennett and Universal Film Corporation. Although there is no account of the animals involved in the play, there must have been horses, probably supplied by what is now Sunset Ranch. The production apparently was a huge success, with profits from ticket sales–$2,500–donated to Actor’s Equity. An encore performance, produced by Griffith and Sennett, was held a few weeks later at the Majestic Theater downtown. 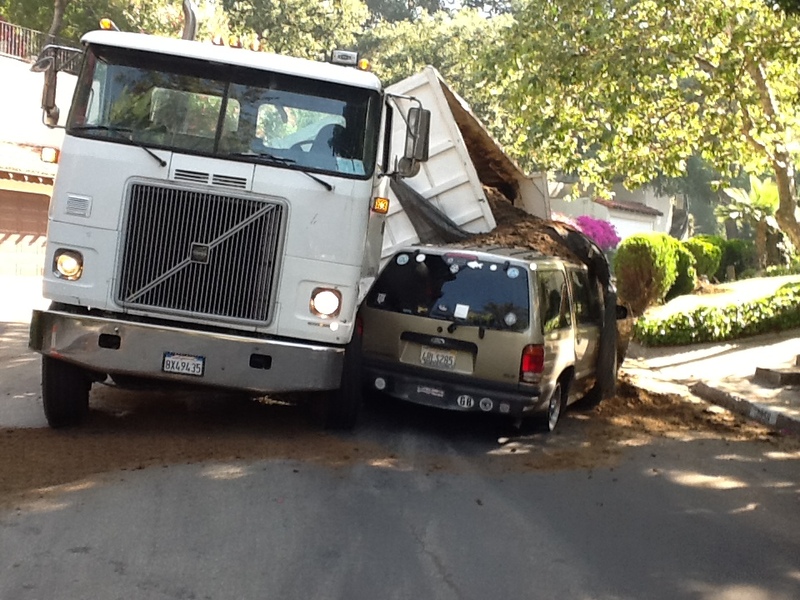 Why was Beachwood Canyon chosen for this extravaganza? Primarily, it was because the location was (and, as Hollywoodland residents can attest, still is) a natural amphitheater where every sound would be amplified exponentially. The bowl shape of the future Beachwood Village provided the perfect contours of a theater. Moreover, the area was both unbuilt and easily accessible via the Franklin Avenue streetcar. The success of the 1916 “Julius Caesar” led directly to the Theosophical Society’s 1918 production of “The Light of Asia,” a pageant based on Edwin Arnold’s epic poem on the life of the Buddha. That hit led its Theosophist organizers to search for a permanent amphitheater for large-scale and (they hoped) inspirational pageants. One of the pageant’s stars, H. Ellis Reed, soon discovered in nearby Daisy Dell not just a larger version of Beachwood Canyon but the largest natural amphitheater in the United States. Once the land was purchased by “Light of Asia” organizer Christine Weatherill Stevenson and another wealthy arts patron, Mrs. Chauncey D. Clarke, construction began on what would become the Hollywood Bowl. Although Stevenson ended her involvement (and was reimbursed for her share of the purchase) when other organizers decided the Bowl would fulfill a civic rather than religious function, she must have been pleased by the Bowl’s first large-scale event: the Easter Sunrise Service of 1921. Among the Hollywood Bowl’s other early spectacles was a 1922 production of “Julius Caesar,” also starring Tyrone Power and a cast of thousands. This time, photos survived; they will appear in a future post. Luke McKernan, “Shakespeare in the Canyon,” June 26, 2007, The Bioscope. Kevin Starr, Material Dreams: Southern California Through the 1920’s. Oxford University Press, 1990. 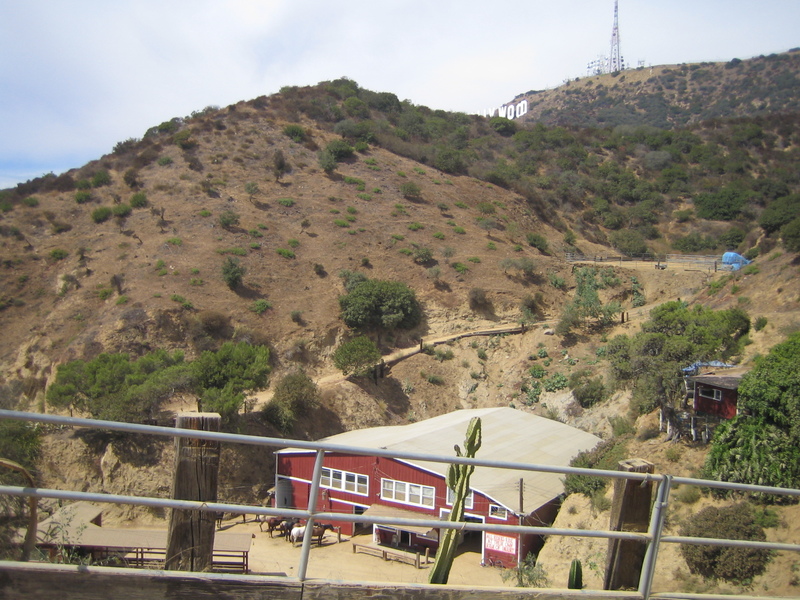 Sunset Ranch occupies a hilly space at the north end of Beachwood Drive, where the Canyon meets Griffith Park. Although many people know it as a riding spot, few realize the ranch predates Hollywoodland, the 1923 housing development that abuts it. 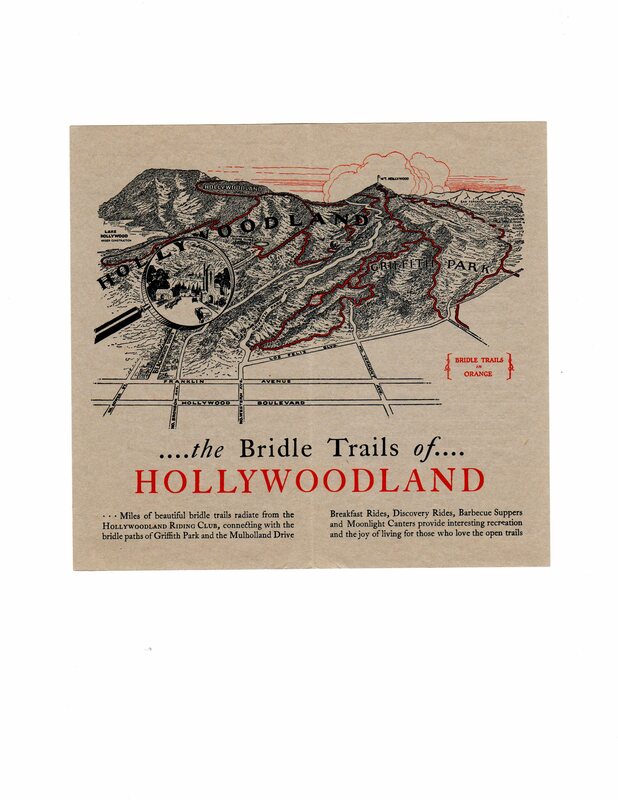 Before the property was developed by a real estate consortium headed by Harry Chandler, all of Hollywoodland was ranchland. Residents also enjoyed a clubhouse and tennis courts near the north end of Beachwood Drive, where some sixties-era houses now stand. A jitney running from Beachwood Drive to the trolley stop at Franklin and Argyle ferried residents back and forth, a necessity in the days of one-car families. Though the clubhouse faded away during the Depression, limited car service from the Village bus stop to houses up the hill continued into the 1950’s. Subsequent decades brought new construction, more residents and through traffic as Canyon Lake Drive connected Beachwood Canyon to Toluca Lake. Through it all, only Sunset Ranch remained unchanged, offering trail rides, boarding, horses for movies and itself as a shooting location. Its most famous recent appearance was in David Lynch’s “Mulholland Dr.” The scene in which the Cowboy delivers an ultimatum to the young movie director, Adam Kesher (Justin Theroux) is both surreal and frightening, as Adam drives his Porsche up a darkened Beachwood Drive, parks and enters a paddock lit by a single flickering bulb. My first inkling that it wasn’t going to be an easy afternoon was when my previously booked interviewee, a Ranch employee, got a serious case of cold feet and tried to back out. Somehow I persuaded her to go through with the interview and eventually coaxed an amusing story from her, about some clients on the dinner ride who, after too many margaritas, had a hard time staying on their horses. An employee overheard this and reported back to the manager, who sent an emissary to inform me that I couldn’t use the story and moreover that he would have to see a rough cut to “approve” the interview. Much later, I interviewed a former Sunset Ranch riding instructor who told me of spending the night in one of the rooms over the barn and hearing a man being hanged, along with choking sounds and the vibration of the rope. This was consistent with the Romeo-and-Juliet story I’d heard about a 16-year-old Mexican boy who worked at the ranch in the 1920’s. He fell in love with a Hollywoodland homeowner’s daughter and she with him, but it was an impossible situation given their class and ethnic differences, as well as the mores of the day. Despondent that he could never be with his true love, the boy hanged himself in the breezeway between the stalls. Then there’s the strange, wafting scent of gardenias each autumn. Riders and ranch employees report smelling gardenias on the trails in mid-September, near the anniversary of Peg Entwistle’s suicide off the Hollywoodland Sign. No gardenias grow in the area, but Peg wore gardenia perfume. On December 26th, 2007– a night when 90 mile-an-hour winds uprooted a stand of 70-year-old Torrey pines on Woodhaven Dr., just above the village–the Ranch was involved in a freak riding accident. The circumstances were these: an engaged couple had booked a private dinner ride for that night. It was a birthday gift from the man to his fiancee, a romantic night ride for the two of them, led by a guide. Though the woman an inexperienced rider, the guide inexplicably put her on a new, skittish horse; despite high winds, they set out for Toluca Lake. When the guide moved to the front along the narrow passage between Mt. Lee and Mt. Hollywood, the horse bolted, set off by the winds. 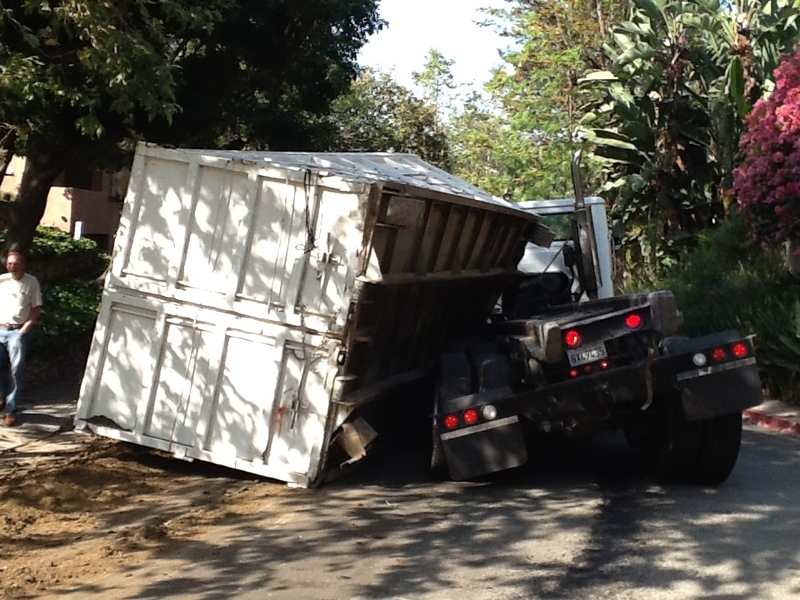 The woman fell off ; despite her headgear (all riders at Sunset Ranch are required to wear helmets) she suffered a cerebral hemorrhage and never regained consciousness. Her grief-stricken fiance returned every night for two weeks to mourn at the place where she died. Although her parents filed a huge lawsuit against the ranch, accounts of the accident and the eventual settlement were somehow kept out of the news. You are currently browsing entries tagged with Sunset Ranch at Under the Hollywood Sign.